Ben Anderson will be speaking on mobile apps and the dealership at Automotive Boot Camp in Las Vegas May 15-17. Anderson’s workshop on dealership mobile apps will educate dealers on when to invest in mobile, how quality mobile apps can create long-term relationship channels with their customer, tracking results, and mobile best practices from top dealers. “I'm excited to share strategies and best practices innovative dealers have been using to connect with their mobile customers,” stated Anderson. Session attendees are encouraged to bring mobile devices and computers to the presentation. Working with dealers hands-on, Anderson will use workshop themes related to mobile apps, QR codes, push notifications, and mobile customer retention. 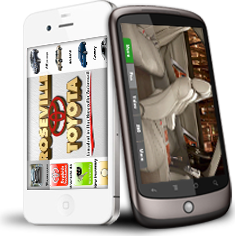 Mobile marketing is currently a hot topic for the automotive industry. Anderson's session will include the latest industry data and examples from top dealers. Anderson speaks on mobile to a variety of automotive forums including J.D. Power Automotive Internet Roundtable, DrivingSales Executive Summit, and Digital Dealer Conference and Expo. Ben Anderson is the moderator for “Mobile Marketing and the Dealer”: A video series interviewing key influencers in the dealership market on mobile marketing best practices. Ben is the president of AutoMotionTV and a nationally known marketing entrepreneur. AutoMotionTV is a leader in mobile apps for the dealership market. The AutoMotionTV Dealer App is a laser-focused communication channel between the dealer and customer. AutoMotionTV works hand in hand with each dealership to successfully launch and promote every Dealership App.